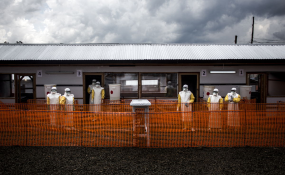 As of March 24, 2019, public health officials have documented that the Ebola outbreak in eastern Democratic Republic of Congo (DRC) has surpassed 1,000 cases; the current total number of confirmed and probable cases is 1009, including 625 deaths and 318 survivors. The outbreak is the largest in DRC's history and the second largest outbreak recorded of Ebola ever (after the 2014-2016 outbreak in West Africa). "This is a disappointing milestone. This remains a highly complex Ebola outbreak with active transmission in 13 of the 21 affected health zones," said CDC Director Robert R. Redfield, M.D. "Despite this, CDC will continue to work 24/7 with our partners in DRC, in DRC's neighboring countries, and around the world to prevent the spread of Ebola and bring this outbreak to an end."